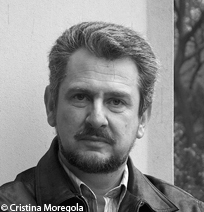 An Italian composer born in 1956 in Bursto Arsizio (Italy). A pianist by training, Alessandro Solbiati studied composition with Sandro Gorli at the Milan Conservatory and with Franco Donatoni at the Sienna Academy. He distinguished himself in various composition competitions, including the International Milan Competition with a String Quartet (1980), and won the RAI-Paganini Prize of Rome with Di Luce, concerto for violin and orchestra (1982). He has taught composition in, successively, the conservatories of Bologna and Milan, as well as at the Centre Acanthes, and he has also led masterclasses at the Paris and Lyons conservatories. His music, performed at leading international festivals, is often written for small groupings (Klimt for string trio and piano, 2007) and for solo instruments (Ibi, bone fabricator ! for flute, 2009). A lover of poetry, Alessandro Solbiati has notably set to music texts by Rainer Maria Rilke, Friedrich Hölderlin and Baudelaire (Attraverso, 1990; Le réveil de mon âme, 2001). Similarly, Russian literature finds an echo in his operas Il carro e i canti (2008) from Alexander Pushkin and Leggenda (2011) from Fyodor Dostoyevsky. Les partitions d’Alessandro Solbiati sont éditées par Suvini Zerboni.